A group of people wishes to elect one of their members as their leader. 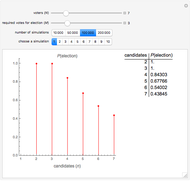 Each member of the group can vote for any member in a smaller set of candidates of size . Candidates can vote for themselves. At least votes are needed to elect a leader. 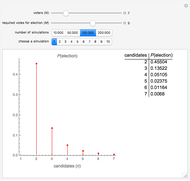 Suppose that each of the people votes for one of the candidates randomly. The result shows the approximate probability of election as a function of . Snapshot 1: There are 7 voters and 5 votes are required for election. For 2 candidates, . For 3 candidates, decreases to . For 7 candidates (that is, everyone is a candidate), then . Snapshot 2: Again there are 7 voters, but now only a simple majority (4) is needed for election. This is the so-called imperial election problem . With 2 candidates, one of them always gets at least 4 votes, so that the election is certain. For 3 candidates, , and for 7 candidates, . Snapshot 3: There are 7 voters as in snapshot 2, but now only 3 votes are required for election. With 2 or 3 candidates, one of them always gets at least 3 votes, so that the election is certain. For 4 candidates, , and even for 7 candidates is as high as 0.438. Snapshot 4: There are 25 voters, and 17 votes (two-thirds of the votes) are needed for election. This is the so-called pope problem  that refers to the papal election in 1513. 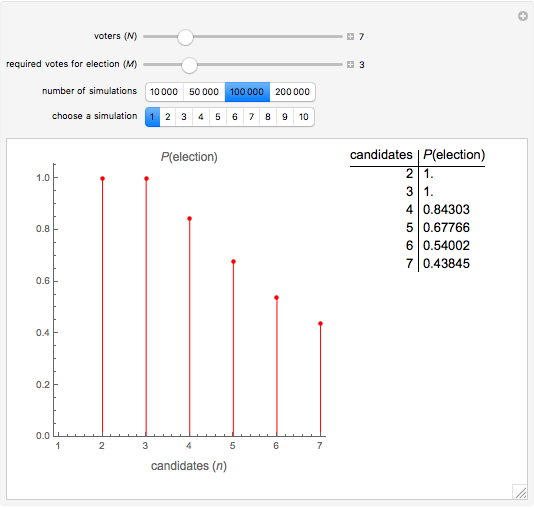 For 2 and 3 candidates, the probabilities of election are approximately 0.109 and 0.0013, respectively. The Demonstration is based on problem 19 in . 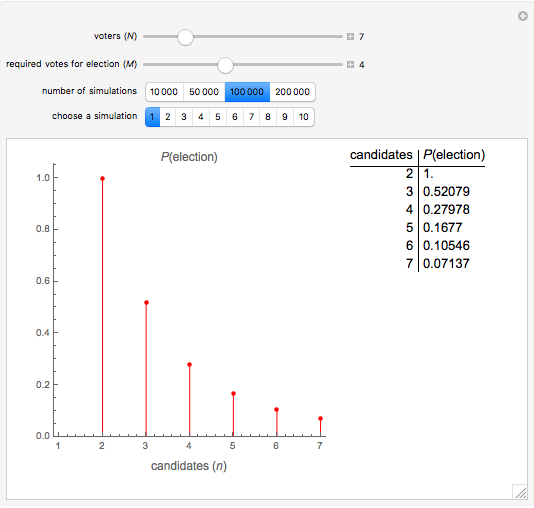 Heikki Ruskeepää "Probability of Election in a Vote"